A river is a flowing water-body, a symbol of movement, a goddess, a nourisher of life and a harbinger of culture and civilisation. A river finally mingles with the ocean. Every major river flowing through India has been captured in sculpture, painting and literature. Rivers are worshipped and songs sung in their glory; civilisations have sprung on their banks,thrived and evolved. Indian rivers originate from the Himalayas and Karakoram range in the north,the Western ghats or Sahyadri in the West, Vindhyas and Satpura in central India. Important rivers in India are Ganga, Yamuna, Chenab,Beas, Kaveri, Godavari, Tungabhadra, Narmada and Tapti to name a few. Saraswati is a mythical river which flows underground and meets Ganga and Yamuna at Sangam, in Allahabad. Rivers have been spectators of human history and even influenced course of events in history across millennia, all over the world. Rivers are ecosystems and sustain many forms of life.Their depiction in art whether in factual form or as mythical goddess, is fascinating to behold. Rivers are an important part of Indian mythology and folklore. The Ganga originates in the Gangotri glacier, the Yamuna in Yamunotri glacier in Uttarakhand, north of India. The river Yamuna merges with Ganga at Allahabad. The Brahmaputra originates in Tibet but merges with Ganga and ends in the Bay of Bengal. The Hooghly river is a tributary of Ganga in West Bengal. The Indus river originates in the Tibetan plateau and enters India in Jammu and Kashmir and merges into the Arabian Sea. Chenab river originates in the upper HImalayas in Himachal Pradesh; Jhelum is at tributary of Chenab river. The Beas rises at Himalayas in central Himachal Pradesh and joins Sutlej river in Punjab. Kaveri originates in the Western Ghats and Krishna at Mahabaleshwar in Maharashtra, also in the Western Ghats. Godavari starts in Maharashtra passing through seven Indian states. Tungabhadra is a large tributary of Krishna in Karnataka; ending in Bay of Bengal. Narmada starts from Amarkantak in Madhya Pradesh and ends in Arabian Sea. Some river depictions in art include the sculptures at Ellora, miniature paintings, watercolours, oils and drawings by various artists at different points of time. Ellora is the epitome of rock-cut architecture in India. 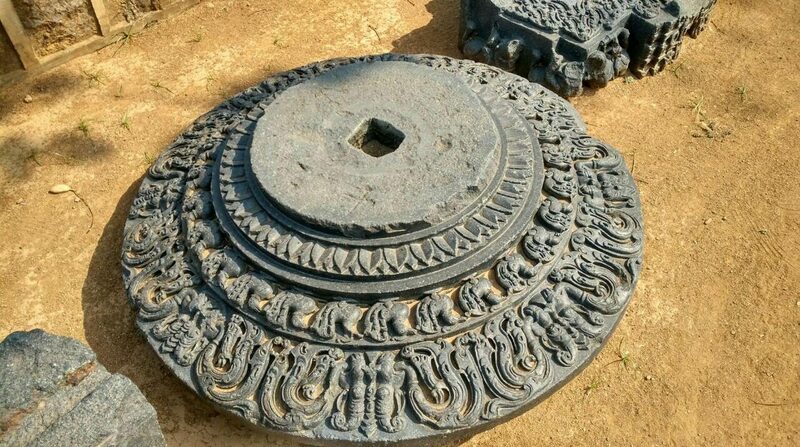 It is to the north west of the city of Aurangabad in present day Maharashtra.Built and carved between 5th and 10th century under patronage of the Rashtrakutas and Yadavas. There are 34 caves in all, out of which 17 are Hindu, 12 Buddhist and 5 Jaina caves. Goddess Ganga at Rameswar Cave, Ellora, Maharashtra. Goddess Yamuna. Gupta period, 5th Century, Ahichchhatra, UP.,National Museum, New Delhi. Goddess Yamuna, seen with an attendant holding a parasol. The depictions of Indian rivers in artworks and sculpture are stunning as images and showcase the beautiful partnership between human beings and nature. A folio from the Isarda Bhagavata Purana painted in 1560-65 from Agra-Delhi area of North India, watercolour and ink, manuscript painting shows Krishna with gopis. The Bhagavata Purana is one of the eighteen great puranas of Hinduism. It lauds devotion or Bhakti to Lord Krishna, incarnation of Vishnu and discusses many subjects including mythology, cosmology,yoga, music , dance and geography. It was probably composed between 6th and 10th century. Gopis seen bathing in the Yamuna,asking for their garments from Krishna, from the Isarda Bhagavata Purana, 16th century. Gopis ,Radha and Krishna next to the Yamuna during a thunderstorm. A drawing of an island on the Narmada river,1813. Raja Ravi Varma is a celebrated artist from Kilimanoor, Travancore(1848 – 1906) who combined European and Indian techniques, who made available lithographs of his works at reasonable prices to people, which made him very popular. His depiction of Hindu deities and episodes from Hindu epics and literature made him legendary, yet very close to the common man. Lord Rama crossing the Sarayu river with Sita and brother Lakshmana at Ayodhya, Uttar Pradesh. This entry was posted in art history, rivers and tagged ganga, ghats, rivers, yamuna on August 31, 2016 by historyreads.